In 1831, artist Caleb Robert Stanley made a water colour painting of Adelaide Cottage in Windsor Home Park. It was acquired in 1839 by Queen Victoria and now belongs to the Royal Collection. There were rumors that circulated in 2018 that the Duke and Duchess of Sussex would settle in Adelaide Cottage as their country home. The Daily Mail broke the news citing an unnamed source, although Kensington Palace did not confirm this news. It was later announced that the couple would establish their official residence in Frogmore Cottage at the Frogmore Estate. Adelaide Cottage is a spacious house is located in the bucolic Windsor Home Park. It was built in 1831 by Robert Wyatville as a retreat for William IV’s wife Queen Adelaide. The cottage orné (ornamental cottage) was built on the site of the Head Keeper's Lodge, using materials from the Royal Lodge, demolished after 1830. 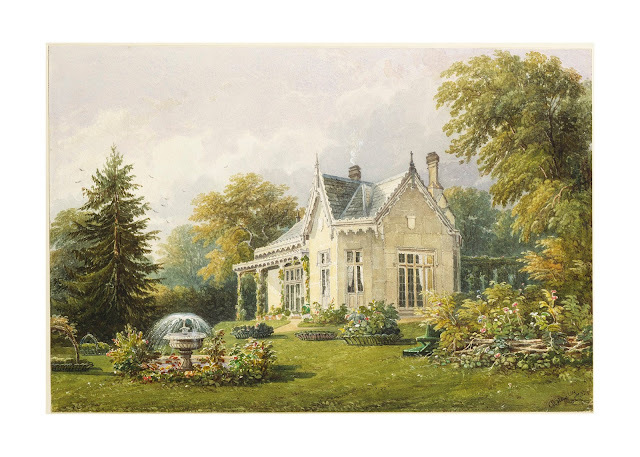 After her death, Adelaide Cottage became an attractive royal retreat and Queen Victoria frequented the cottage for breakfast or tea. The lodge was later offered to succeeding Royal dignitaries and courtiers. Simon Rhodes, son of the Queen’s cousin and best friend Margaret Rhodes, who died in 2016, was the recent tenant of the property. However, it was Group Capt Townsend who was the cottage's most famous resident. As King George VI's equerry, he was given the Adelaide Cottage as a grace-and-favor property in 1945. He lived here with his wife Rosie Marchioness Camden until they divorced in 1952. In a profile entry on Historic England, the house's principal bedroom is described as having "coved ceiling with gilded dolphins and rope ornament reused from the Royal yacht "Royal George'". A marble Graeco-Egyptian fireplace boosts the room's character. Just a short drive from London, Adelaide Cottage is nicely located at a secluded atmosphere yet accessible to the Queen and the Duke of Edinburgh’s private apartments i Windsor Castle. It is also just a few miles away from Guards Polo Club in Windsor Great Park, which is frequented by Prince Harry. Shortly after their wedding, unfounded reports circulated that the Duke and Duchess of Sussex would take York Cottage on the Sandringham Estate as their country home. However, it is now impossible to have York House as a royal resident since it now serves as the office of the Sandringham Estate.